What Other Tags Do I need? So what makes a great OP/ED for me? Well there are a couple of things I look for, especially for a "baka gaijin" like myself. For starters, I love me some piano, if it's got some then I'm probably all in. Sometimes if someone's voice is like honey in my ears (Minori Chihara for example) then I'm all down to listening to some powerful or strong vocals from certain artists. Accessibility is a major factor as well, by that; I mean how easy it is for me to reproduce the music and sounds. Oh, and the level of "Engrish" in a song can sometimes be what pushes an OP/ED from okay, to freaking great, but that's always going to be subjective from one person to another. Songs sung by character/s (or more accurately the voice actor singing as their character in the song) from the show are enticing as well, especially if you like the character. Oh and how catchy the song is (probably the same as accessibility), you can't go wrong if it's cute and poppy or if it's just got a killer chorus you can't shake off. Okay some people have implied that I've been too confrontational or aggressive when I was making the suggestion for how you should start your new year with my last recommendation. I get that, totally understandable! So instead I've think I've found a song more suited to the more laid back and chilled personalities that happen to hang around these parts of the wood. 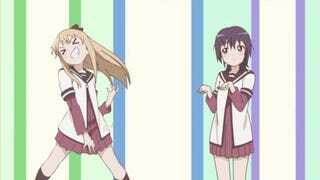 Series: Yuru Yuri Season 2. I had a tough time trying to figure out the right song for you guys. In the end I've chosen this brilliant little song that I hope you can enjoy. The opening to a beloved sequel, and what a way to reintroduce the characters! Standing together on a stage, the red curtain drapes behind them and in turn revealed by a single shining spotlight. Then throw in an inside joke for the faithful, all in the first 10 seconds or so! It's a song that I take at face value as I listen. It's as song that lets you know that even though not every day of your life is going to be special it doesn't mean that you can enjoy each day all the same. It's something you can still cherish every moment from being late to school to just being bored at school/home/work. The small things of everyday life like idle chit chat with friends and family to slacking off from work and taking time for yourself. IT could be said as long as you laugh and have fun then you're more or less in a perfect position. You don't have to go out your way to do this and that and seem interesting, just do whatever makes you happy and laugh till you drop. Remember you can have the best day of your life any day. "You've got a smile worthy of first prize." So yeah the song is pretty catchy, it has some nice visuals that are well synchronised with the music. It's filled with energy and happiness and it complements the show nicely. Characters from the show are singing as well, so as I mentioned it's always fun to hear them within the songs. Vibrant colours everywhere, almost neon, which kind of fits with some of the techno keyboard components of the song. What more is there to say about this, it's enjoyable, fun and it somehow as always fits the series name in the song, that's like extra points! FruityDrinks is not responsible for any of the consequent events that should transpire after the publication of this freaking awesome piece of literature. Should you happen to disagree with any of the above content, please transcribe your comments & thoughts on a piece of parchments and send it via Owl to Avian Sama, Minulle. Also FruityDrink is not a female middle schooler who is being educated in Japan but you can make it come true with enough dogecoins donation. OP/ED A DAY #168 : K-On!